As normal follow through the screen shots below; you will need this link to get a hold of the installation components – http://winscp.net/eng/download.php. Final step! (I know this was almost too easy….) Run the .cmd file and assuming everything is listed right you will soon have a complete listing of all of your network switch configurations (more in the screen shots). You might also want to consider expanding your setup using the information in my Automated Change Detection and Reporting – Network Switches post which sets things up so that you receive email notification each day listing out any changes in your configs. 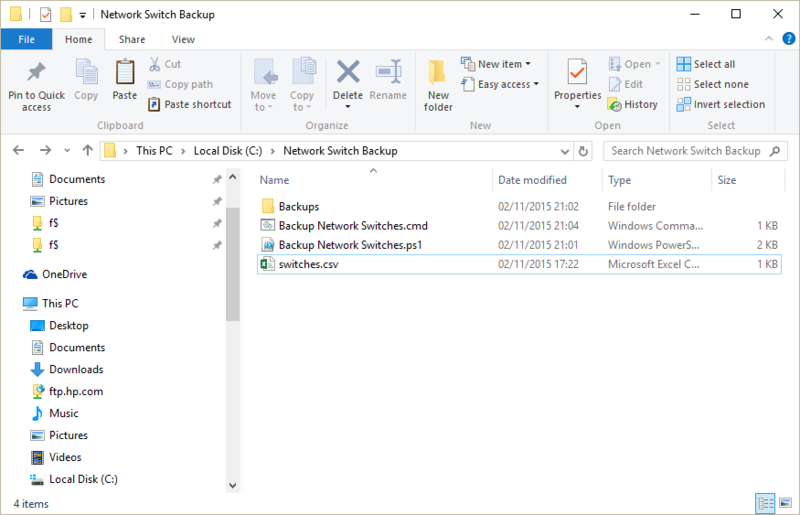 I’ve been researching how to best automate our networks’ backups for a few hours, and this is by far the easiest, most effective, and most secure solution I’ve come across so far. Everything else either relied on TFTP or telnet or required an expensive purchase. This was easy to set up, and as long as access to the backups and CSV folder are set responsibly you’re good to go. Thanks! in PowerShell, which created the folder with the IP, but doesn’t download the config file into that folder. What is the model and firmware version of the switch that you are connecting to please? In addition can you confirm that you’ve carried out the steps in ‘Getting your Switch ready and filling out the CSV’? Thank you so much for the script. It works a treat however I’ve bumped into 2 issues. 2.) This isn’t a fault with the script at all, more just me trying to get it to do what I want it to do. So, I’m going to use the script to pull a config daily using task scheduler. However, I want to incorperate SVN into this so it only keeps one file but has version control. That bit I can do no problem, yet for some reason I can’t get it to change the name the file saves as. For example, it’s currently saving as “2017-1-9”, but ideally I’d like for this to be saved as “swt-1-ben”. Is this possible to do? Again, thank you so much for this script, automated backup solutions have been driving me mad! Lot of typo’s in my previous request. The script work for me. If I already got the host name folder in the backups folder it is giving error “hostname already exists”. I am thinking something like create a new folder date wise. If I am running the script today it should create folder 05072017 under backups and then create individual host name folder. That way I can keep a copy of previous config’s as well. can you help me to do that. Could you provide the full error message from PowerShell please? I must say it’s a very cool script that makes only one click to save your configs. Thank you very much James ! This explenation is really nice, thx! I have one problem, we have an “@” in our password. I think because of it, the connection doesn’t work. If I use a password withouth “@” it works. Is there solution that we can keep a password with “@”? Just a heads up, this still appears as one of the top results for backing up Procurve configs automagically and it works a treat. Thanks so much 🙂 We’ve got a huge mix of network gear and 30+ procurve switches throughout the company. This just made my job considerably faster. I’m useless at scripting but I’ve made a couple of cosmetic changes. If you couldn’t find the WinSCP Automation downloads, you’ll need to make the following changes. Adds some spaces to the file name, adds the device hostname and adds a file extension to cheer me up. I’ll get some dns records added and it’ll be lovely and tidy. 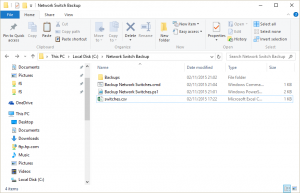 New-Item : An item with the specified name C:\Users\vanguye\Desktop\Network_Switch_Backup\Backups\10.239.98.58\ already exists. Don’t remove the first line in the .CSV file and it works. is there a way to get the config from this model ? I’m afraid I don’t have any of that model to hand – can you SFTP to it and send me a screenshot of the file structure? As i understand from error message this system dont support ssh-rsa 2048. is there any solution for this problem. Thnx. hi i would like to store morte than one file. ( as backup) any solutions? Hi, i need an automatic Reboot of more than one switch.